I haven’t read the book by Max Brooks, but the lovely Barbara assures me that the movie is a major departure. 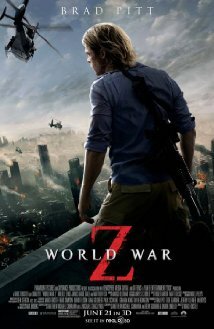 Instead of an oral history of a war with the undead as told by the survivors, World War Z tucks us into Brad Pitt’s hip pocket as a battle-hardened U.N. inspector who swings into action to find an antidote for the latest zombie plague. One fine day, while shepherding their two darling daughters to school in Philadelphia, Gerry Lane (Pitt) and his wife Karin (Mireille Enos, from The Killing, who is criminally underutilized) encounter a traffic jam caused by a rampaging band of zombies who look an awful lot like those depicted in Danny Boyle’s 28 Days Later. They’re fast and insanely violent, more like bitey berserkers than your traditional Romero-inspired shambling flesh eaters. Lane is apparently quite an in-demand figure, as he spends most of the film being whisked all over the globe by helicopter, trying to root-source the cause of this worldwide catastrophe. His bacon is saved several times by phone calls to his U.N. superior (Fana Mokoena), who for some reason sees his former coworker as the last, best hope for humanity. Lucky him! And while the rest of the world is engulfed by hungry, hungry humanoids, Lane is repeatedly snatched from the jaws of fate. You will not be bored by World War Z; it moves lickety-split from one dire scenario to the next, always with swarms of zombies in pursuit, clambering over each other to mount the walls and get at the yummy remnants of humanity. But despite their formidable swarming capabilities, the zombies are virtually indistinguishable and often resemble blurry video-game creations. It’s a CGI world we live in I’m afraid, and that makes for an altogether less frightening zombie holocaust.